Kutucu (second left) celebrate after scoring the opening goal against Fortuna Duesseldorf in Gelsenkirchen, Germany, Feb. 6, 2019. 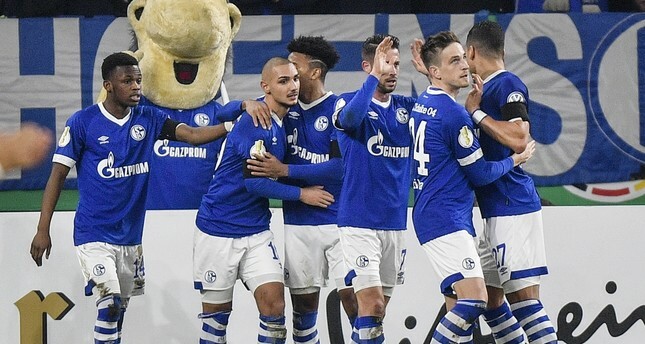 Good news has been in short supply for Schalke 04 this season and while they suffered another blow on Wednesday with the death of their former general manager Rudi Assauer, the emergence of Ahmed Kutucu has given fans cause for hope ahead of their trip to face champions Bayern Munich. Kutucu scored once and breathed new life into a dormant Schalke attack as they crushed Fortuna Dusseldorf 4-1 in the German Cup. It marked the 18-year-old Turkey youth international's first start for the senior team since joining Schalke seven years earlier. The mood ahead of the game had been sombre as home fans mourned the death of Assauer, who became the face of the Ruhr valley club and celebrated the UEFA Cup win in 1997 as well as two German Cups. He passed away after a long illness. After the game, fans were celebrating teenager Kutucu, whose speed, power and drive towards goal are just what coach Domenico Tedesco needs as his team, last season's runners-up, prepares to face the champions in Munich. They then take on Manchester City in the Champions League last 16 later this month. Schalke are languishing in 12th place, seven points above the relegation zone, having scored 24 goals in 22 matches, less than half of leaders Borussia Dortmund's 51. Kutucu scored in the league against VfB Stuttgart late last year after coming on as a substitute. "But this is a completely different feeling than against Stuttgart," he told reporters. "I have been here since the age of 12 and scoring in front of a home crowd was always my goal. "When the fans went crazy after the goal I even had a few tears in my eyes." It would not be a complete surprise to see Kutucu in the starting lineup again on Saturday, a fresh option for Tedesco's struggling attack. But Bayern also look to have shaken off last week's 3-1 league loss to Bayer Leverkusen. They beat Hertha Berlin 3-2 in extra time to advance to the German Cup last eight, though they remained vulnerable at the back. With Bayern in complete control, a Mats Hummels defensive error gifted Hertha an equalizer to take the game into extra time at 2-2. "We have to stop making these mistakes," Bayern coach Niko Kovac said. "This is the main point of criticism this season. We make too many game-deciding mistakes. If we manage to stop these mistakes then we will start winning games easier." Bayern are on 42 points in third place, seven behind leaders Borussia Dortmund, who host Hoffenheim. Second-placed Borussia Moenchengladbach, who are also on 42, entertain Hertha.